Last edition, we talked in depth about the 1993 NBA Finals, discussing the 3rd championship in the Bulls first 3-Peat. 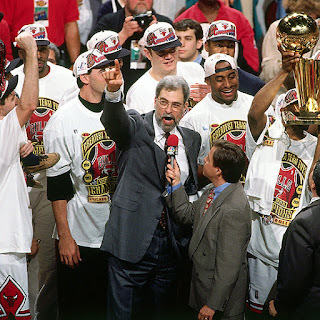 Today, we will take a look at the beginning of the Bulls 2nd 3-Peat as well as briefly touch on the 72-10 season that the Bulls had to lead them to the NBA Finals yet again. Michael Jordan had retired from basketball after the first 3-Peat in 1993, but returned in 1995 after trying an unsuccessful run in baseball. His first mini season back saw him help the Bulls to the playoffs before they were eliminated by the Orlando Magic in the semi-finals, who went on to the NBA Finals to lose to the Houston Rockets. With Jordan back, a focused Bulls set their sights on getting back to championship glory the next season. A trade in the offseason had brought the team Dennis Rodman, and they started off the 1995-1996 season right with a victory over the Charlotte Hornets and a 22 point blowout over the Boston Celtics. The Bulls would end up finishing the season 72-10, going on multiple lengthy undefeated streaks throughout the season. They still hold the record for the greatest regular season record to this day, and they were a definite no. 1 seed in the East. Michael Jordan would be named the NBA MVP, Phil Jackson would win Coach Of The Year, Scottie Pippen and Jordan would both be named to the All-NBA First Team, Rodman would lead the league in rebounds, Jordan would win the NBA scoring title, Toni Kukoc would even win the Sixth Man Of The Year award. For the Bulls, their fate and destiny seemed to be a 4th championship. For the Seattle Supersonics, the 1995-1996 season saw them also set records of their own, going 64-18 for the best record in franchise history and securing the no. 1 seed in the West led by Shawn Kemp and Gary Payton. They garnered a victory over the Bulls in the regular season as well. For the Sonics, they seemed destined to make the Finals as well, with only the San Antonio Spurs or Utah Jazz possibly standing in their way(they were the 2nd seed and 3rd seed respectively). For the Sonics, their road to the Finals started off quite easily, as the duo of Kemp and Payton were electric and decisive in the first round to win the series 3-1 over the Sacramento Kings. They would sweep the defending champions, the Houston Rockets in 4 games in the semi-finals, before going to the Conference Finals to take on the Utah Jazz. As I said earlier, the only teams that stood a chance at eliminating the Sonics from the playoffs were the Spurs and the Jazz. The Spurs had been taken out earlier, so now it fell on the Jazz to stop the Sonics. The Sonics seemed to have the Jazz under control as they took a 2-0 lead going into Utah, but the Jazz responded with a game 3 victory. The Sonics would go up 3-1 after taking game 4 and headed back to Seattle for game 5 with the hopes to close out the series. Utah would fight and push the game to overtime and win game 5 to make the series 3-2. Game 6 saw the Sonics choke a bit, as they were defeated by 35 points to push a game 7. However, Seattle would regroup and ended up taking game 7 in a close finish, making the NBA Finals. The path for the Sonics started off easy, before facing a hungry Jazz team. The Jazz would become a threat in the following two seasons(we will talk about those in the future), but this was the Sonics' year. As for the Bulls, they kicked off the playoffs with an easy 3 game sweep of the Miami Heat, even winning one game in a 31 point blowout. The Bulls would defeat the Heat by double digits in all three games. They would then go on to face their rival the New York Knicks in the semi-finals. For the Bulls, the only team that stood a shot at defeating them in the playoffs were the Orlando Magic, so the Bulls were expected to defeat the Knicks and move on to the Conference Finals. The Bulls won 4-1 over the Knicks and the stage was set for a Conference Finals battle with the Magic. The Magic had the 2nd seed, a regular season victory over the Bulls and they stopped the Bulls last season in the playoffs. Could they do it again? The quick answer to that is no, as the Bulls would sweep the Magic in 4 games to advance to the NBA Finals. 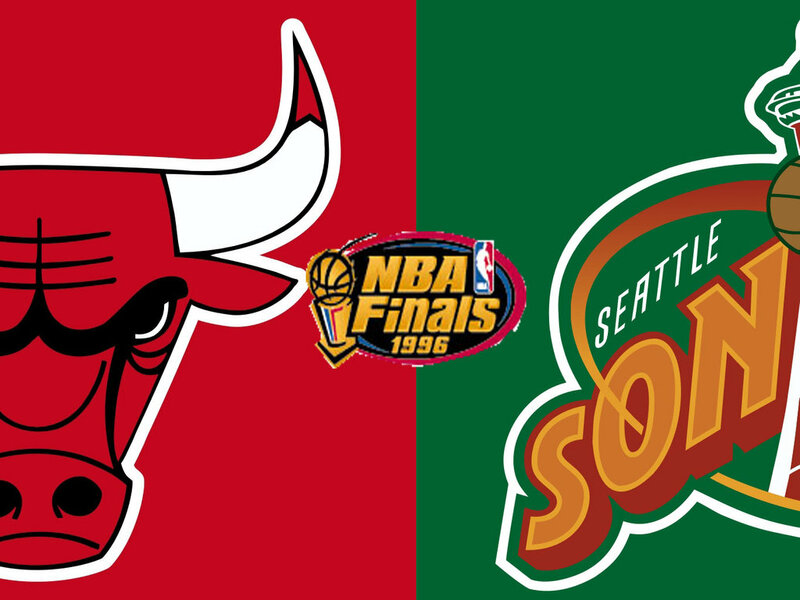 The stage was set for an epic NBA Finals as the Bulls and Sonics were set to do battle to see who would be the 1996 NBA Champions. The starting lineup for the Sonics would feature Ervin Johnson, Hershey Hawkins, Detlef Schrempf, Shawn Kemp and Gary Payton. The Bulls starting lineup would have Ron Harper, Luc Longley, Rodman, Pippen and of course Jordan. -The Bulls struggled a bit offensively early on, but played very good defense to still maintain a lead going into halftime. However, the Sonics would pull within 2 as the third quarter closed. 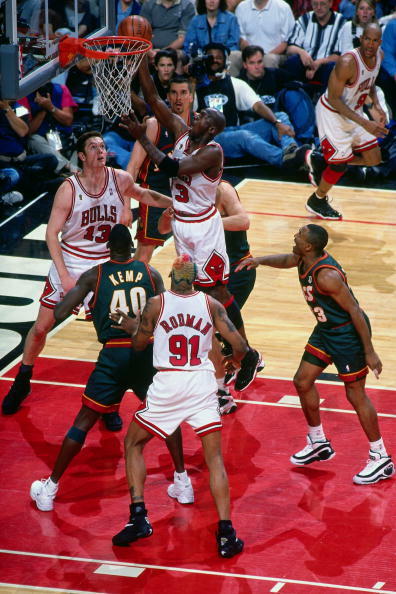 Luckily for the Bulls, Toni Kukoc and even Ron Harper proved to be clutch and the Bulls dominated the 4th quarter to walk away with the game 1 victory 107-90. 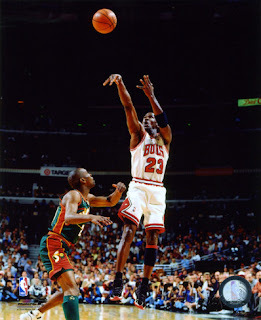 Shawn Kemp would finish with 32 points and 8 rebounds, while Jordan would finish with 28 points. 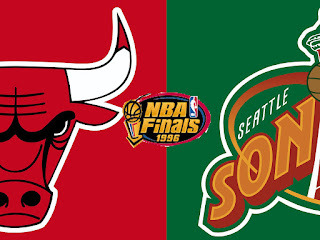 Going into Game 2, the Bulls would have to remain focused, and the Sonics would have to step it up to not go down 2-0. -The Sonics came out swinging in game 2, taking a first quarter lead, but the Bulls would regroup and end up with the lead by halftime. 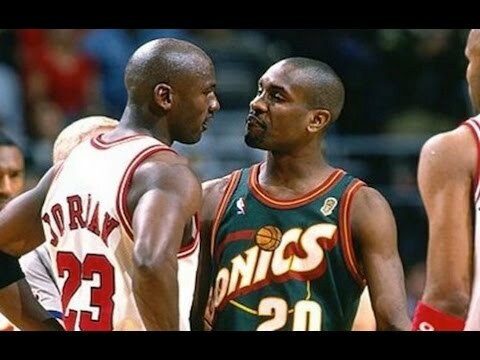 The Bulls would pull ahead by a nice margin to end the 3rd, before the Sonics made a last run in the 4th. 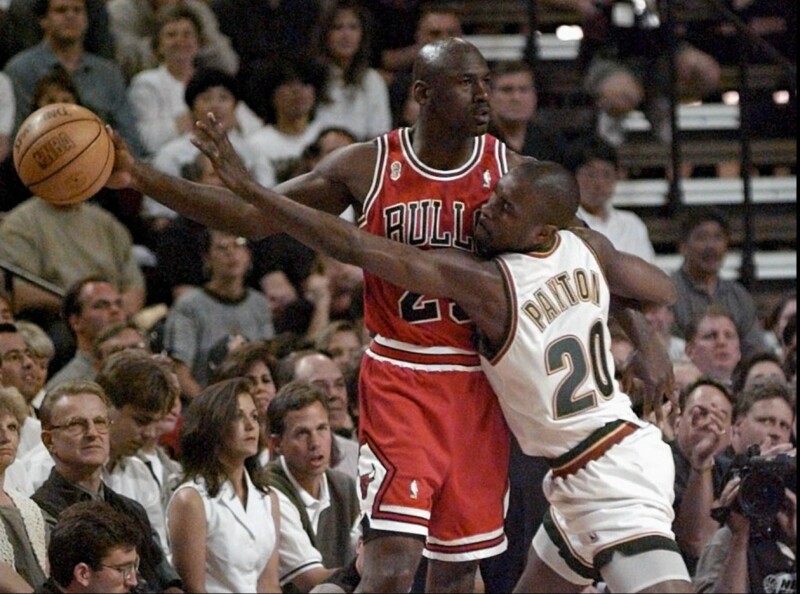 Unfortunately for the Sonics, the Bulls would hold on to clinch a 2-0 series lead by winning game 2 92-88. 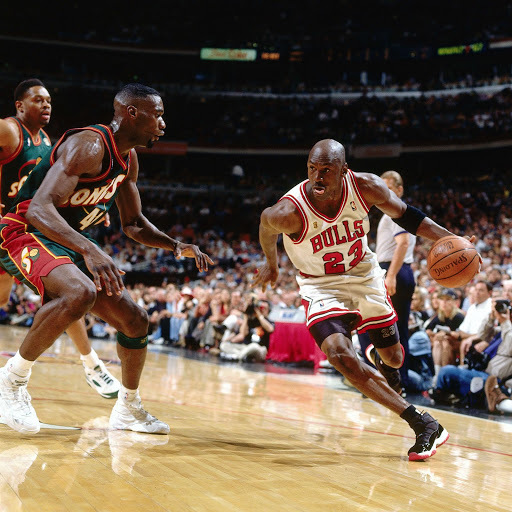 Jordan finished with 29 points and 8 assists in the victory, while Rodman pulled down an amazing 20 rebounds for the Bulls. Shawn Kemp played hard and scored 29 points and pulled down 13 rebounds, but it was not enough. The Sonics had their back against the wall going into game 3. It was must win for Seattle. -After two victories in Chicago, the Bulls traveled to Seattle with the hopes of closing out the series on the road starting with game 3. The Bulls came out on fire and ended the first quarter leading 34-16. They went to halftime leading 62-38 and really never looked back from there. The Bulls would take a decisive 3-0 series lead with a 22 point blowout win, 108-86. Things just wouldn't go right for the Sonics and they would be in a desperate situation. Detlef Schrempf finished with 20 points for the Sonics, and Jordan would step up with 36 points for the Bulls, as it seemed like the Bulls would definitely be taking the championship. Would they sweep the Sonics? Would the Sonics get back and regroup to make history? -Seattle refused to die. The Sonics came out playing hard and ready to get back into the series. After losing in a 22 point blowout in game 3, the Sonics would go into halftime with a huge lead themselves, 53-32. 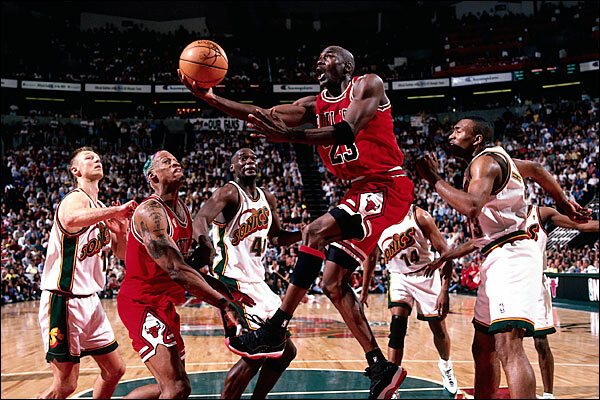 The Bulls couldn't manage to work on this night, as the Sonics kept Jordan to minimal stats, though he finished with 23. 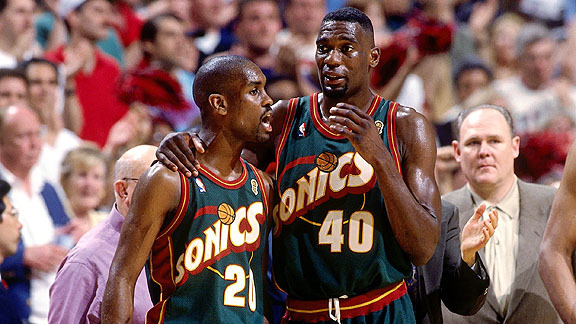 Gary Payton played solid, finishing with 21 points and 11 assists, while Shawn Kemp finished with 25 points and 11 rebounds. The Sonics managed to win by a huge margin, 107-86, to force a game 5 and stay alive in this Finals series. The series was now 3-1. -Game 5 was pretty competitive throughout until the 4th quarter, when the Sonics began to pull away. Shawn Kemp played extremely well in this game, as did Gary Payton, as Payton managed to score 23 points and dish out 6 assists. 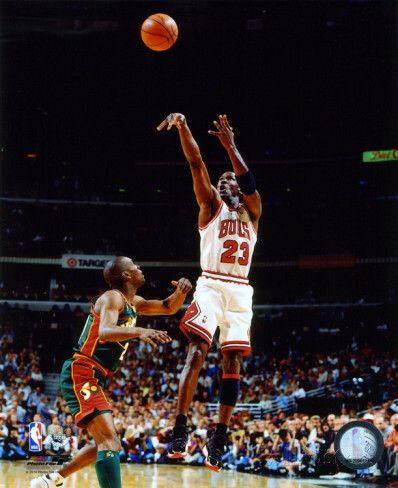 Jordan finished with 26 points, but it wasn't enough to get the Bulls the championship as The Sonics pulled away with an 89-78 victory to make the series 3-2 and force a game 6. Could the Sonics make history and come back from a 3-0 deficit to win the title? -Of course, the answer to that was no. The Bulls were ready to close out the series back at home and that's exactly what they did here. Getting to an early first quarter lead, the Bulls never looked back as they closed out the series with a 87-75 win to become the 1996 NBA Champions led by Jordan's 22 points and 7 assists and Rodman's 19 rebounds. Payton would finish with 19 points and 7 assists, while Kemp would finish with 18 points and 14 rebounds, but the Bulls pulled off the victory and won the series 4-2. 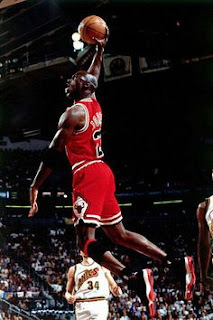 Michael Jordan was of course named the Finals MVP, averaging 27 points per game. The Bulls picked up their 4th championship in 6 seasons and looked to carry that momentum into the very next season. Your 1996 NBA Champions, Chicago Bulls!